According to the March 21, 1912 Tacoma Daily News (TDN)(Tacoma, WA, USA), Joe Bonds was an "all-round" athlete at the University of Puget Sound, in western Washington state. He was excelling in football, baseball, and track, and was about to take up boxing, too. The April 18, 1912 TDN reported: "Bonds says he was born in Texas and came here with his parents about four years ago. That middle name he sports is a corker. He says he had a brother who was named after Robert E. Lee. The brother died, and when Joe was given his handle his parents took the middle initial of the great Confederate leader and twisted it on the last name of the southern armies' general and in this form--Elee--it was slipped to Joseph. Young Joseph comes by his fighting spirit honestly, if there is anything in names." 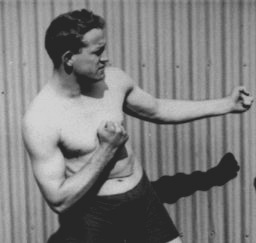 Once he began to box professionally, his manager was Silent Joe Gorman (not the more famous boxer Joe Gorman, however). The two split up by August 1914 when Bonds felt that Gorman was seeking too much publicity for himself. (Gorman reportedly had a fancy walking stick made for himself inscribed with: "From your many Tacoma fans," or words to that effect.) Bonds's next manager was Sol De Lue, per the August 11, 1914 TDN. He was still studying law at this time. And he was being managed by Jack Kearns. See also the Feb. 25 & June 5, 1915 Tacoma Times . By 1918, Bonds was in the United States Navy at New York . He returned to the Tacoma area circa 1920, at which time he was working at Day Island. The June 21, 1920 Tacoma News Tribune reported the birth of Joe Elee Bonds III. By late 1920 Bonds was the Athletic Director of the Lumbermans Athletic Club at 1147 Commerce St., Tacoma. Trivia: Bonds fought Jack Dempsey three years before Dempsey became the World Champion. There is a photo of Bonds "sparring" with James J. Corbett in the Jan. 5, 1915 Tacoma Daily News.